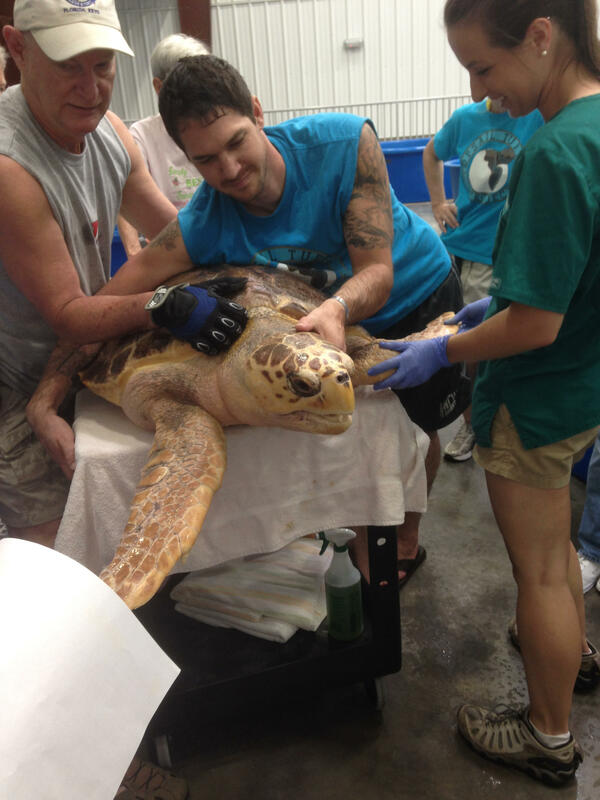 October, a loggerhead sea turtle, swimming in a tank at the Karen Beasley Sea Turtle Rescue and Rehabilitaion Center. Both of her front flippers were badly damaged in an accident. October is clearly not happy. 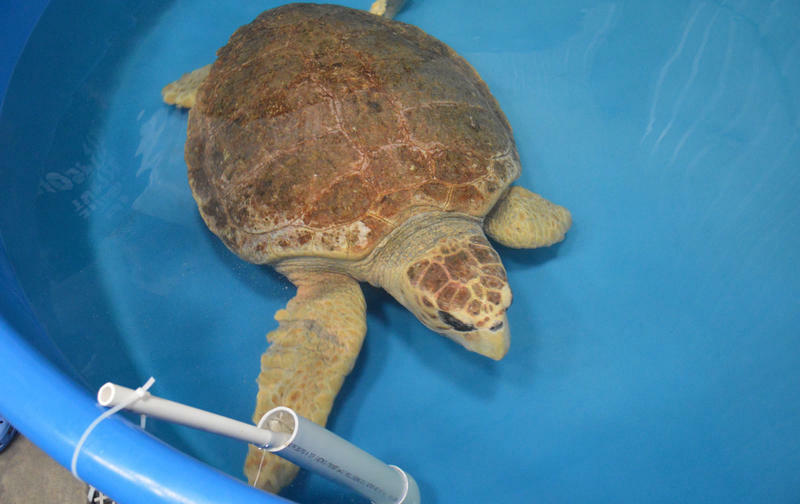 And when a 250-pound loggerhead isn’t happy, caretakers at the Karen Beasley Sea Turtle Rescue and Rehabilitation Center have found that lovingly slapping her shell seems to calm her down. October needed plenty of security – and medical care – when she arrived in the fall of 2013. Her left-front flipper had been severed and her right-front flipper was barely hanging on. She also had propeller wounds on her shell. October is a reminder of sea turtles' fate as a species. Acidified oceans are getting warmer, causing dramatic weather changes and distress for sea turtles across the globe. Turtles, of course, are hardly alone. Almost every animal, fish, crustacean – you name it – are affected somehow by climate change. And it’s showing up in North Carolina in various ways. More sharks – even great whites – are showing up in the Pamlico Sound. Alligators are increasing in density in protected areas of North Carolina. And harp seals that live on the pack ice in the Arctic are showing up from Carova to Cape Lookout. For October, recovery meant undergoing surgery and spending time in a large, blue plastic pool about the size of a Mini Cooper. She’s done very well, but during today’s exam, Craig Harms - an aquatics veterinarian at NC State’s Center for Marine Sciences and Technology - is concerned that the propeller wounds have left some rough edges on her carapace. He’s on the fence about whether October is ready to be released. A sea turtle undergoes an exam at the Karen Beasley Sea Turtle rescue and Rehabilitation Center in Surf City. Climate change and the unpredictable weather events it creates have led to more cold-stun events in the northeast, and the growth of a tumor-causing virus called Fibropapillomatosis, or FP. Previously, FP only afflicted turtles in warmer waters, but recently, turtles are showing up here in North Carolina with it. And while the spread of the FP virus is connected to its ocean environment, it’s what we are doing to the land - as a response to rising sea levels - that may pose an even greater threat to turtles. Beach nourishment projects are growing in scope and size along the North Carolina coast. Some say rebuilding beaches will actually help turtles, giving the creatures somewhere to nest. But Harms says turtles need very specific sand conditions to lay eggs. Needless to say, the rebuilt beach can’t have basketball-sized rocks. That’s what happened during a current project a few miles away in North Topsail Beach. Town leaders there had to request an extension to remove the rocks – one that was granted by state and federal authorities. That means bulldozers and road graders are staying on the beach during nesting season. Beach nourishment proponents say every effort is being made to protect the turtles. Regulations designed to protect sea turtles are also being loosened elsewhere in North Carolina. Earlier this spring the National Park Service proposed shrinking the protective buffers that must be maintained between turtle nests and vehicles on the beach at Cape Hatteras. * That rule change came after North Carolina congressional leaders pushed the federal government to do so. State lawmakers are also getting involved. When she appears on the crest of the dune, the crowd gathered on the beach in Surf City breaks into cheers. Craig Harms (right), a veterinarian at NC State's CMAST, helps load October into an SUV for the short drive to the beach, and her release. October has been cleared to go home. 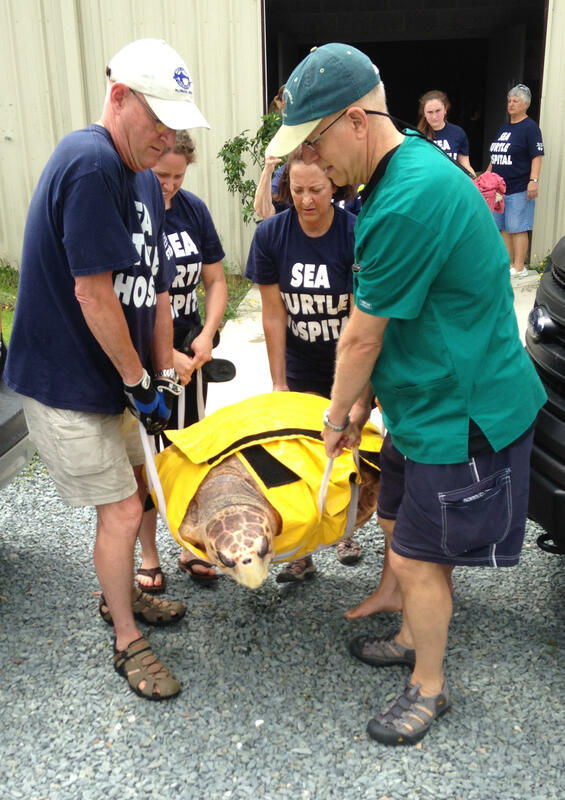 Three volunteers and Harms, the vet, are carrying her as hundreds watch on the beach. Jean Beasley stands in the middle of them, waving October and her handlers toward the ocean. And now, when the turtles go, it’s into a much different world than they’ve ever known. When October’s handlers put her fully healed flippers into the Atlantic Ocean, she doesn’t hesitate. The loggerhead paddles furiously, takes a slight turn to the right, and, in a minute or so, she’s gone, heading for the open ocean. The best guess is that October is probably around 20-to-30 years old. That gives her another 20 or 30 years of laying eggs, maybe right here on this beach. With changes to the climate – and our efforts to save structures and our own way of life along the beach - her future on the Carolina Coast is perhaps less certain than it’s been in tens of millions of years. *Correction: The original version of this story incorrectly stated that the U.S. Fish and Wildlife Service had shrunk the protective barriers. The supervising federal agency is the National Park Service, and the changes are still proposals.